Our Vineyard Series is a collection of limited-production wines that offer their own inspired variations on the contemporary and innovative style of our Paraduxx red blends. 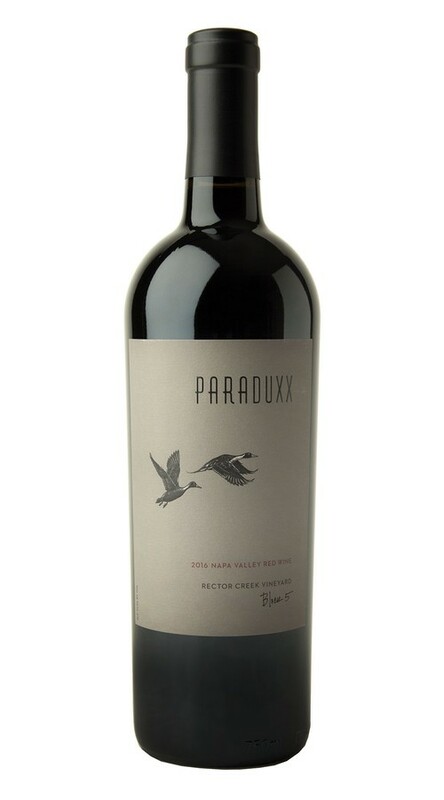 Grown in the rocky soils of our Rector Creek Vineyard, which surrounds the Paraduxx winery, this alluring blend balances the Bing cherry and herbes de Provence elements of the coveted Cabernet Franc from our Block 5, with the raspberry jam and white pepper character of great Zinfandel. Both beautiful and bold, this fascinating blend of Cabernet Franc and Zinfandel offers aromas of ripe cherry and cranberry, along with layers of saddle leather, flint, cocoa and brambly spice. On the palate, flavors of sandalwood, cassis and fresh-cracked pepper are supported by supple tannins and a subtle note of maple syrup. 2016 was an incredibly successful harvest for Paraduxx. Starting on August 15th with our Rector Creek Estate Viognier and ending on October 20th with perfectly ripened Rutherford Cabernet Sauvignon, the season was seamless. Overall, we harvested 15 different grape varieties from 14 different Napa Valley appellations. The growing season was filled with warm sunny days, intermittent cool weeks, and no rain events to speak of—all of which were ideal for achieving perfect ripeness with good natural acidity. Overall, there is a lovely elegance to our 2016 wines, with soft, velvety tannins and ripe, impeccably balanced berry flavors.